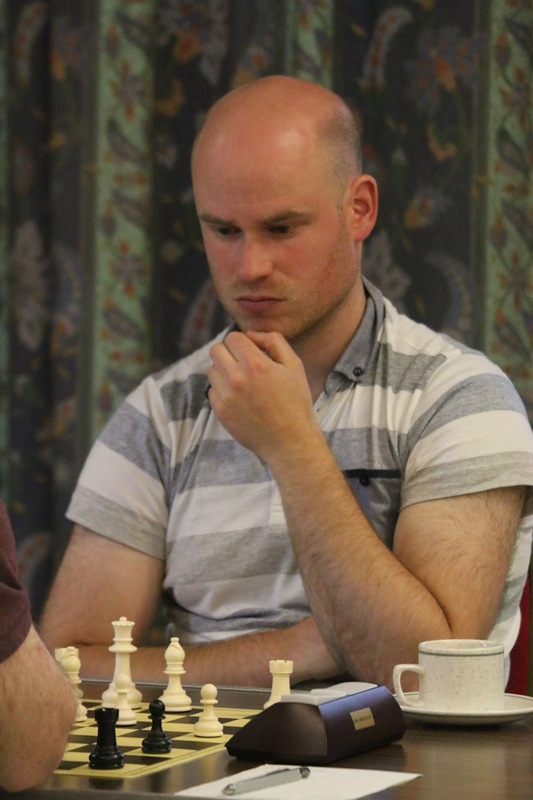 The nine-round FIDE Open ended yesterday, with Suffolk's sole entrant, Ed Player (right), on five points. Ed experienced one of the known pitfalls with the Swiss pairing system and a large entry (of 247 players). Winning with White in Round 1, he faced a strong FM with Black in Round 2. The colours alternated throughout the tournament, with Ed facing mainly lower-rated opponents when he had the White pieces, and higher-rated ones when Black. In fact the average rating of his Black opponents (when he had White), was 2009 (scoring 4½/5), whilst his White opponents was 2372 (scoring ½/4). The tournament was won by Dutch GM Benjamin Bok, who scored 8/9, a clear point ahead of the field. The ten-round Super Rapidplay Open is taking place over this weekend, with Adam Taylor and Ed Player entered. There is a massive entry of 367 players! After five rounds today, both Adam and Ed are on three points.